Venue: Olimpiyskiy Stadion Fisht, Sochi. Australia will try and take advantage of the situation ahead of the final round of play in Group C as they take on the already-relegated Peru side on Tuesday afternoon in Sochi. Peru are eliminated after two narrow defeats to Denmark and France. Australia won just one point in two games so far, but a win here will likely help them go beyond the group stage. Los Incas will, however, be a super tough nut to crack as they’ve shown splendid displays so far in the tournament in spite of defeats in both affairs. Socceroos came to Russia in low spirits following the sudden managerial change as Bert van Marwijk took over Ange Postecoglou who had initially qualified the Aussies for the World Cup. Nevertheless, the team showed the will and determination to leave an impact and they will come into the last round fixtures with genuine chances of progressing to the knockout phase. To get there, Australia need a victory over non-motivated Peru and France’s win over Denmark in the other game of the group. While France will certainly be massive favourites to see off the Scandinavian opposition, beating the high-quality Peruvian squad should be quite a challenge here. Ricardo Gareca’s troops are probably the unluckiest side of the tournament so far. They showed a fantastic build-up play against both Denmark and France having certainly deserved well more than zero points after two outings. It was their playmaker Christian Cueva who missed the penalty-kick just before the break in the clash with the Danes, while Pedro Aquino’s thunderous effort hit the woodwork against France. Bert van Marwijk made no changes to the squad which fell 2-1 to France on the opening day. He will be forced to make at least one here following the complicated shoulder injury for Andrew Nabbout who has most likely finished the tournament. Tomi Juric should lead the line on Tuesday, while it will be interesting to see if veteran Tim Cahill will get some minutes in Russia. Also, it’s interesting to mention youngster Daniel Arzani and Hull City’s Jackson Irvine who made a strong impact upon coming on from the bench in a 1-1 draw to Denmark. 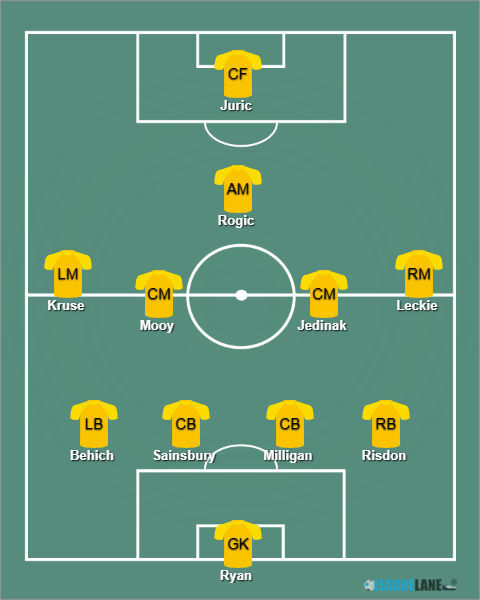 Ryan – Risdon, Sainsbury, Milligan, Behich – Leckie, Mooy, Jedinak, Kruse – Rogic – Juric. The Peruvian head coach made two changes in the starting line-up for the clash against France. Pedro Aquino and Paolo Guerrero were introduced to the squad instead of Renato Tapia and Jefferson Farfan. Gareca should stick to the 4-2-3-1 formation here as we expect to see Guerrero leading the line once again. Farfan will likely get the chance to feature off the bench in the second half. The former Watford winger (now moved to Benfica) was one of the standout performers in the narrow loss to France. We expect him to cause a number of troubles to the Australian defensive line on the day. 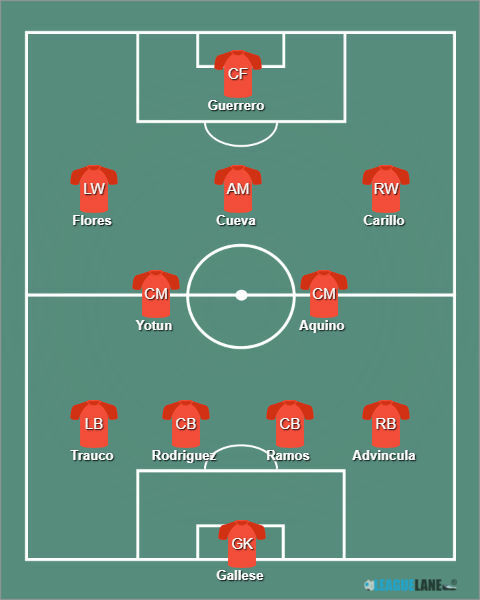 Gallese – Advincula, Ramos, Rodriguez, Trauco – Aquino, Yotun – Carrillo, Cueva, Flores – Guerrero. The two teams did not have the chance to take on each other in the past. 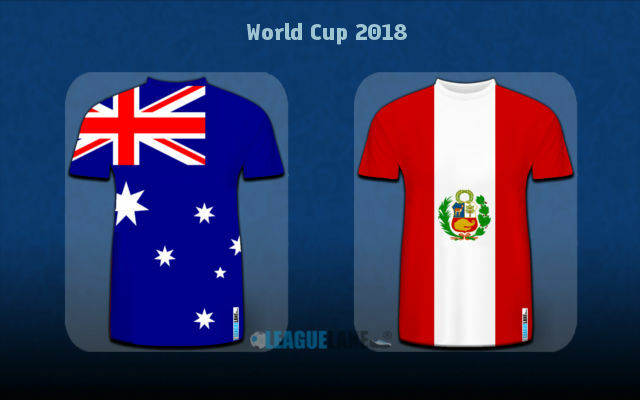 Peru continued to be a side very tough to break down having only shipped two goals in their opening two ties. Starting from the inter-continental play-offs ties with New Zealand, they’ve shipped just three goals in last nine internationals, meaning the Aussies could struggle to break the deadlock and grab the much-needed victory here. Los Incas did well in transitioning the ball onto the opponent’s half, but they just lacked the finishing touch in past two affairs. Can it finally come here on Tuesday when they will entirely be pressure-free against Socceroos? Van Marwijk’s men did not show much in the final third, but they’ve managed to score once against France and Denmark apiece. Both of their goals came from the penalty-spot with the captain Mile Jedinak making no mistake on any of the occasions. They might need another penalty to put the ball behind Pedro Gallese and his super stern defensive-line. The good news for the Peruvians is they should really be able to find the back of the net in a World Cup affair for the first time since 1966 when they’ve last scored a goal at this tournament. Gareca has reasons to hope for such scenario knowing that his rivals have not kept a single clean sheet in last 12 World Cup contests. Moving forward, Socceroos are on a horrendous run of four defeats and a draw in last five World Cup outings. In all, we see a strong value in backing Peru to clinch the victory at the odds of 2.45. Peru to keep a clean sheet also looks like a decent bet at 2.75. Predicted Full-Time Result is a clean sheet win for Peru. Peru to win @ 2.45. Peru to keep a clean sheet @ 2.75. Correct FT Score: 2-0 Peru @ 12.00.